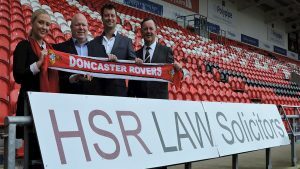 Forward looking solicitor’s firm HSR Law has joined the Club Doncaster ‘Official Partnership’ programme during an exciting period of expansion for their company. HSR Law has strengthened both its commercial property and residential conveyancing departments in the last twelve months, and they are looking to add to its portfolio in these areas. Fabian Braithwaite, partner at HSR Law said that he felt the progress being made by Club Doncaster at present was akin to that of his own company. He said: “Doncaster Rovers and Club Doncaster are highly ambitious, professionally run, and have a real investment with the local community, making them the clear choice for HSR Law as a commercial partner. “HSR Law has made great strides in the last twelve months and we look forward to progressing over the coming year with the support of Club Doncaster. Based just outside the town centre on South Parade, their office is a little tucked away and Fabian insisted the ‘Official Partnership’ with Club Doncaster would seek to increase visibility. He said: “Our solicitors have provided legal advice to generations of clients and businesses in Yorkshire, Lincolnshire and Nottinghamshire for more than 150 years. The ‘Official Partnership’ at Club Doncaster has a range of promotional, hospitality and advertising benefits that HSR Law will take advantage of during their time working with the club. The firm plans to give away 20 tickets to our Boxing Day clash against Northampton Town to its social media followers, amongst many other innovative campaigns. Club Doncaster’s new partnership executive Antonia Dowie said that she was looking forward to maximising the opportunities that HSR Law had to utilise. She said: “We put the ‘Official Partnership’ package together to give our partners as many different ways of communicating with our fan base as possible. “HSR Law is a great example of a company that is proactive in the way it markets its services, which lends itself perfectly to the creative nature of our ‘Official Partnership’ package”. For more information on the services provided by HSR Law or working with Club Doncaster, email commercial@clubdoncaster.co.uk or call 01302 765665 to speak to a member of the team.